Create Custom Packing and Shipping Tape! Standard tape width is 2" (other widths available by special order). Create custom packing and shipping tape! Personalize with logos, photos and custom messaging. 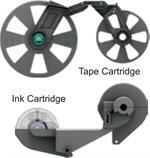 Tape cartridges for use with the Brother Tapecreator Pro system.